Not sure what to serve your dinner guests tonight? Don't fret, Chef Boy-Ar-Dee is here to help! 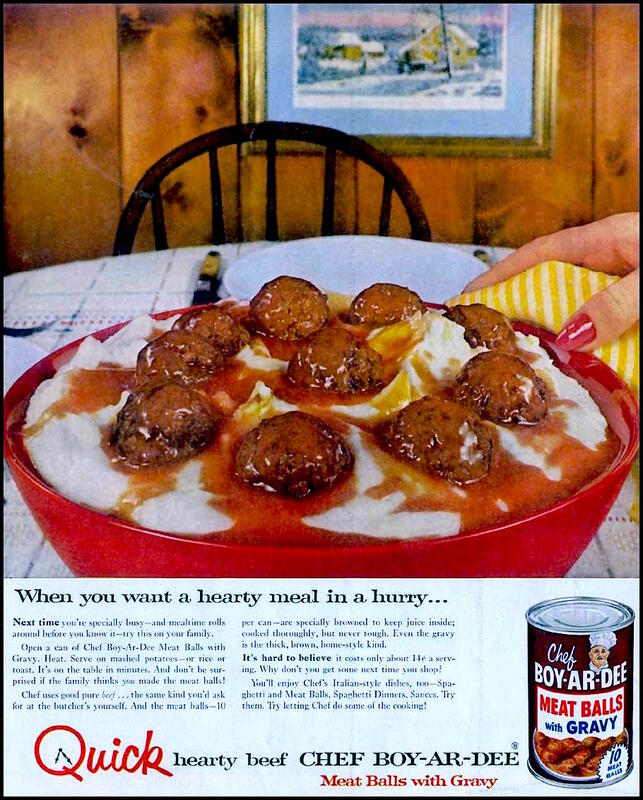 Chef Boy-Ar-Dee Meat Balls with Gravy is the perfect quick-fix dinner and each can contains 10 whole meatballs! Just heat and "serve on mashed potatoes - or rice or toast." It's guaranteed that your guests will be licking their chops and asking for the recipe! It's too bad that this convenience product from 1955 is no longer available because we would have loved to try it. There is something unique about the flavor of Chef Boy-Ar-Dee meat products and we can only imagine what the gravy tasted like!